As North American Aerospace Defense Command (NORAD) Tracks Santa ramps up this year, the New York Air National Guardsmen and Royal Canadian Air Force personnel of the Eastern Air Defense Sector play a key role Dec. 24. 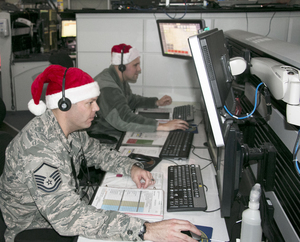 "NORAD has supported Santa Claus' Christmas Eve operations for 60 years and we are always delighted to help," said Col. Emil J. Filkorn, EADS Commander. "I can assure everyone that EADS will do everything in its power to assist Santa with his critical mission." EADS is a sector for the Continental NORAD Region. Like NORAD, it is a joint, bi-national military organization composed of U.S. and Canadian military forces, federal civilians and contractors. It is located within Griffiss Business and Technology Park in Rome, New York. Its mission is to counter all air threats to the eastern half of the continental U.S. through vigilant detection, rapid warning and precise tactical control of NORAD forces. The same radars, satellites and interceptors employed on December 24 are used year round to defend Canada and the United States. Photo by Capt. Jason Cole, 224th Air Defense Squadron.